Hello my fitness friends! How are you? Are you keeping up your fit and healthy lifestyle choices? You can do this! It’s easy to have momentum and then lose it. How do you keep going when you’ve lost motivation? 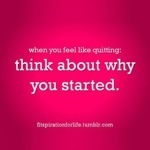 Think about why you started? It’s good to reevaluate the reasons you decided to workout regularly, drink more water, eat healthier! Go back to that place. No one said it was going to be easy. Don’t get discouraged if the results don’t come quickly. It took more than one meal to put the weight on. It will take more than one healthy meal to get it off. It takes 3,500 calories to equal a pound. You are worth it! Don’t give up. So you pigged out all weekend. No worries. Get back on the wagon. You’re a super star! You’re a champion. Champions don’t quit. There’s nothing like a good challenge. Start training for something. Join a class, and if you’re medically cleared…challenge yourself to grow stronger! Along the way you will have days you’d rather sleep in or lay on the couch. Just remember warriors train to win. You’re strong. You can do far more than you think. Self motivate! This is your life. Don’t let life slip by watching re runs on Hulu or Netflix. Your mind, body, and soul will thank you. Your future self will thank you!!!! Well, I’m cheering for you. Don’t settle for treating your body (temple) with anything less than respect and honor! Previous Post 30 Day Shred and New Year Changes!